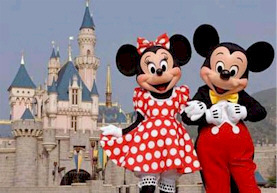 Shanghai could be welcoming their very own Disneyland park as early as 2012. The theme park, with an estimated cost of 40 billion yuan ($5.8 billion), will be located on the east bank of Shanghai’s Huangpu River, bordering Pudong district’s Chuansha town and Nanhui district, an unnamed source close to Shanghai government was quoted as saying. Shanghai Disneyland, 20 minutes’ drive from Pudong International Airport, will be eight times larger than the one in Hong Kong – the first in China. The source told the paper that 10 sq km of land has been set aside for the park. Shanghai is approximately 764 miles away from Hong Kong so that puts one Disneyland park relatively close to another. For example, Walt Disney World in Orlando is a bit over 2,100 miles from the original Disneyland in Anaheim. According to the agreement, Shanghai Disneyland will not adopt Hong Kong’s operation model, in which the government leases the land to the Walt Disney Company. The Shanghai government will provide the land, cover most of the construction costs and hold a controlling stake. It will pay the Walt Disney Company for using the brand. Sounds like a franchise arrangement to me. This leads me to wonder what would happen to the park if there was ever a disagreement with Disney and the Shanghai government. Would the government have to buy Disney out or visa versa and what would happen to the quality of the park? An official announcement on the decision is expected around the time of the Beijing Olympics. Hat tip to China Daily. Postscript: In a follow-up to original media announcement of a Shanghai Disneyland, Reuters reports that Walt Disney Co and the Shanghai government have both denied a media report that a planned Disneyland project in Shanghai has obtained central government approval. Doesn’t mean it isn’t going to happen, just that a final deal has yet to be made. “The project still needs central government approval and Shanghai will obey Beijing’s decision,” Shanghai spokesman Chen Qiwei said, adding he will make new inquiries on this to relevant departments. Disney also denied the report. “There is no agreement and there is no deal,” Disney spokeswoman Alannah Hall-Smith said in an e-mailed statement. There you have it. We will just have to wait and see what happens. We would assume the prognosis as 85 – 95% positive as the official announcement will naturally precede Disney’s confirmation. Lets hope it happens.